For a long time now I've wanted to add a section of my personal favorite photos. These are photos that mean something to me personally, or make me smile, or remind me of a really great time I had. In some of them I like the dramatic lighting, the sense of serenity and tranquility, or have fond memories of the people pictured. Many of these photos you'll see in other sections of this website, some have never been posted until now. But in any case, I thought it would be convenient to put some of my favorites all in one easy to browse section. I will be adding notes to most of these photos over the next few days to give some context to them and explain why they are meaningful to me. Some of them, I happen to think are among my best work also. I hope you enjoy them. I've just added 20 new wallpapers that have never been posted before. Just click the link directly above to view and download this new collection. I hope you enjoy them. As this site evolves, one of my main aims is to add helpful and detailed travelogues of the places I've been. I've always learned so much from reading other's accounts of their trips. A well written travelogue almost makes you feel like you've been to a place before you ever get there. That's what I hope to provide with the travelogues below of some of my recent trips. Others should be added soon. As you may have noticed, I've updated the travelogs from Laos and Thailand with new photo galleries. I've added hundreds of photos that have never been seen on this site before. I've been reluctant to add these photos because they're basically my personal snapshots, not representative of my best work. But I've come to realize that they are worth sharing if it gives anyone a look at life on the other side of the world or helps someone in planning their own trip... or better yet, encourages someone to go to these places themselves. So I hope you enjoy these new photos. If so, drop me an email and let me know. From Laos, I've added photos of Luang Prabang, Vang Vieng, the Mekong River, Pak Ou caves, and the rural hills of Route 13. In Thailand, you'll see new photos of Krabi and Railey Beach, my trek near Chiang Rai, Pai, and Bangkok. I'll soon be adding a gallery for Cambodia as well. Please click the links above and check out the new photos. I've gotten several emails lately asking about other work I might have that's not on my site. It's true that what's on this website only represents a small part of my work, and most of it is my recent work. Someone mentioned doing a Google search on my name and said, "Do you know you're everywhere on the internet?" I think that's greatly exaggerated, but it made me curious. So I Google searched my own name and got a pleasant surprise as I found some things that I'd written and photos I'd taken that I had forgotten about or didn't even know were online. There were several other sites that mentioned me for some reason or another scattered here and there. You should try it sometime and see what comes up. You don't realize what a wide footprint you leave until you Google yourself. So, since doing this, I've decided I'm going to work on assembling a page here that links to other photos and writing I have on the web. Two places to see some of my other photos are Photo.net, where I've posted for many years, and TrekEarth.com, a travel specific photography site where I've posted some of my better work within the last year. A lot of what I've written isn't published online, but for those things that I can find published online, I'll assemble them on a page set aside for my writing. Lastly, I've given in to the MySpace craze, so I'm putting my stamp on one more corner of the internet. Feel free to connect with me there if you like. Check out a new section I've added to the site called Photo Pundit. I hesitate to call it a blog, but from time to time I'll add articles that give my thoughts and opinion about various topics relating to photography and travel. I made my first trip to Peru recently, from May 13th through the 30th. I visited Cusco and the Inca sites surrounding it, hiked the Inca Trail, visited Machu Picchu, and then spent a week in the Amazon. I'll be adding more photos, in addition to the ones already linked here, in the days to come. 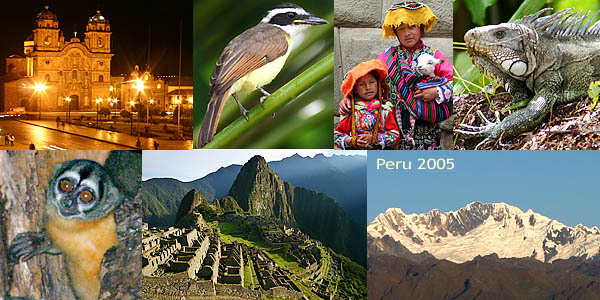 I'll also be adding my entire Peru travelogue. I hope you enjoy it. And please let me know if you have suggestions for how to improve the information presented here. If you like what you see on these pages, please write me and let me know. I love getting email from anyone and I will reply. All photos and content © copyright 2001-2005 Todd Adams. All rights reserved. No photos may be copied, published, printed, or linked without the express written approval of the photographer.